The awesome organization Cloud Covered Streets has been doing amazing things for the homeless community in Arizona as well as several other states, and today they are launching a major GoFundMe campaign called "Shower the Streets with Love" to raise money to buy trailers which will allow the homeless community to have safe and clean places to shower, to do laundry and to update and print resumes. Cloud Covered Streets was started by Robert Thornton, who also owns and runs Paper Clouds Apparel as well. Paper Clouds Apparel is set up to help the special needs community. We did a story about Thornton and his organizations last fall and you can read it here. The goal is to raise $176K, which is no easy feat, but Thornton is always ready to face a challenge to help others. You can go to https://www.gofundme.com/ccs-showers to watch a video from the company explaining the mission and showing the needs., as well as to contribute to this amazing cause. Stop for just a moment and think about all of the comforts and things that you probably have in your life that you might sometimes take for granted; a warm shower, roof over your head, washer and dryer to do your laundry, access to get your haircut and maintain your hygiene. Now for a moment, imagine a life without these things, and the challenges that would create for you. Latest estimates have 600,000 homeless in the United States. The overwhelming majority of them have no place to shower, wash their clothes, or get a haircut. Our mission is to change that, but we need your help! Cloud Covered Streets is a newer 501c3, gaining our non-profit status in May of 2016. 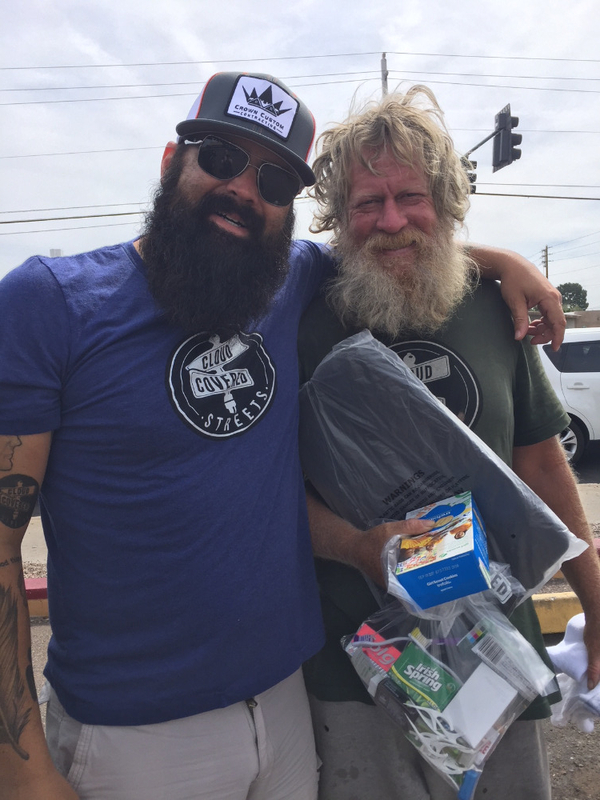 In the last year, our street teams have handed out over 10,000 new shirts, socks, backpacks, toiletry supply bags, shoes, and other supplies to the homeless. Now onto phase two of our mission, which is getting mobile shower and laundry trailers on the streets and giving the homeless a safe and free place to clean up, wash their clothes, and get haircuts. The facilities that are run by the city to give the homeless a place to shower are dangerous and full of the bad elements of the streets. we have homeless friends who have gone months without showering rather than go to the shelters to shower. Some don't go to the shelters because when they use the shower, they are forced to leave all the belongings unattended. They may come back clean, but their stuff has either been stolen completely, or rummaged through and anything of value is gone. This is devestating to a homeless individual because when you own so little, those items are your world. Another problem with the shelters are the drug dealers from the streets that hang out there. Our homeless friends trying to stay clean want to steer clear of the area because they know that they will probably give in to their addictions if they don't. There are so many homeless individuals who want to find work and earn their way off the streets, but the realities of being able to find a job while going to a job interview with less than ideal personal hygiene and dirty clothing are slim. We will give them the resources and opportunities to change their situations. In addition to the showers and laundry services, we will have stylists heading out with our trailers and offering free haircuts to the homeless. We also will bring out wireless laptops and printers, with people ready to help update a resume or fill out a job application. We will give the homeless the tools and help needed to get off the streets, but we also know that the last step is up to them. Too often the homeless are treated as less than human and feel as if no one really cares about them. We are going to show them that people do care, and are willing to help them feel valued, cared for, empowered, and that they can get off the streets. We want to show campassion and kindness to our fellow humans who have fallen upon hard times. We want them to feel "human" again, with some of the bare necessities of life that most of us take for granted. Our first trailer will be based in Phoenix, but will make trips to Tucson as well. Trailer number two is headed to Austin, and number three to St. Petersberg. Our goal is to have 25 trailers on the streets by 2025, and will keep moving onward until we have trailers in every city with the need for one. Help us bring back humanity to some amazing souls who have lost their way. Help us Shower The Streets With Love ! Cloud Covered Streets is a 501c3 non-profit, so you will be able to use your donation as a tax credit as well ! You can also see a complete breakdown of where the money will be spent and why it is needed on the GoFundMe page. We can all do amazing and impressive things when we come together to make a difference in the lives of others. Don't miss out on your chance to shower the streets with love.